Stop politicking and serve wananchi, President Kenyatta tells leaders – Kenyatta University TV (KUTV). All Rights Reserved. 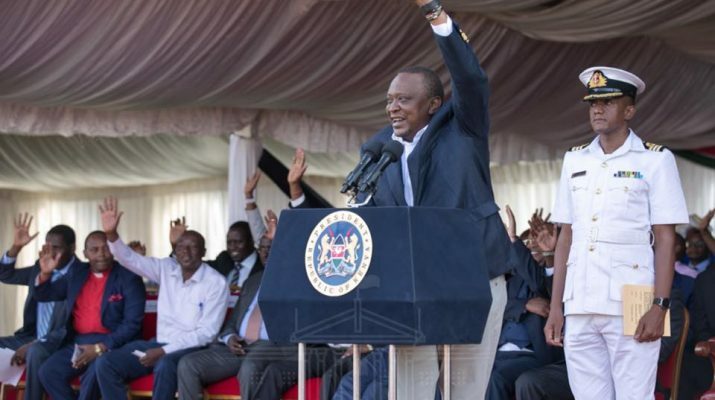 President Uhuru Kenyatta has called on leaders to stop politicking and instead concentrate on activities aimed at improving the lives of Kenyans. The President said Kenyans are no longer interested in empty rhetoric but are keen on working with those who are ready to serve them. The president who spoke in Karatina town where he opened a modern market, said it is time for leaders to fulfil the pledges they made to wananchi during the campaign period. “We don’t want to politic, we have come from a very competitive season of politics where twice we held presidential elections. It’s time for us to serve wananchi,” the President said. The Head of State said the reason for the building bridges initiative was to rally all Kenyans to join hands and build a strong, prosperous and stable nation. “That’s why you saw me and Raila Odinga seat down and agree to work together for the benefit of Kenyans. Competitive politics is not enmity,” President Kenyatta said. The President told central Kenya region leaders to be focused on the needs of their people by prioritising key development projects for the national and county governments to implement. “Solutions to the challenges lies within you. Last week, when I sat down with Western region leaders, they expressly told me their desire and that of their people, was the revival of sugarcane farming. You too need to be focused and agree on what is required for your people,” said President Kenyatta. On the new Karatina market, President Kenyatta urged the locals to utilize it maximally by increasing food production. He said the new market would only benefit the locals by enhancing farming activities so as to create opportunities for economic growth. “Its now time for the Governor and his administration to come up with a fair system of allocating stalls so that our mothers can continue with their activities,” said the President. The President at the same time castigated government agencies which destroy stalls and market spots for small scale traders without giving them adequate notice and alternative areas to operate from. He said it was unfortunate that recently stalls for people operating business along Nairobi to Nyeri in Karatina town were demolished at night to give way for road expansion. “It is wrong to go at night to someone’s business and destroy it. Why don’t you talk and give those concerned adequate notice to remove their wares,” the President wondered. Earlier, the President made stopovers in Nyeri and Karatina towns to acknowledge greetings from wananchi who had come out in large numbers to welcome him. President Kenyatta said the government is keen on improving the lives of all Kenyans through the Big 4 development agenda. The President who had laid the foundation stone for the construction of a terminal building at Nyaribo airstrip urged the residents to take advantage of the expansion of infrastructure in the area by engaging in more income generating activities. He said the expansion of Nyaribo airstrip in Nyeri will open up the region for tourism and trade. The airstrip, which has a 1.3 kilometre asphalt runway, is experiencing increased activity since the launch of commercial flights from Nairobi to Nyeri in early October this year. The airstrip, which currently seats on 190 acres, is to be expanded to have a three-kilometre runway on acquisition of a further 200 acres from the neighbouring community. The President told residents of Nyeri that his government is keen on reviving coffee farming within the central region by providing subsidized fertilizer to farmers. “We know most of you have been depending on coffee farming for your livelihood. We will launch our coffee project starting with Nyeri and Kirinyaga counties by giving out subsidized fertilizer to scale up coffee farming activities,” President Kenyatta said. He said his government is keen on implementing the universal healthcare programme pointing out that Nyeri County has been selected for the pilot project which will be launched in December. “Nyeri county is one of the four counties benefitting from the universal healthcare pilot project. Once we succeed then we know many families will be able to access affordable quality health services,” said the President. President Kenyatta said the universal healthcare programme will ease the burden on many families that have been forced to use their meagre resources for medical expenses. “We know many Kenyans have had challenges holding fundraising activities to offset medical bills. Once we succeed in the pilot project, this would be a thing of the past,” President Kenyatta assured Kenyans. The President said installation of modern facilities is ongoing at the Othaya referral hospital and soon it will be commissioned to give the residents quality and affordable medical services. Leaders led by Governor Mutahi Kahiga thanked the President for his commitment to unite Kenyans and address challenges facing Kenyans through the Big 4 agenda. “Our unity is what will make us strong and also determine our future,” the Nyeri Governor said.